Premium Protein with Dessert-Like Taste! Sustained Increases in Blood and Muscle Amino Acid Levels Optimal Rates of Muscle Protein Synthesis, or Anabolism (Building of New Muscle Tissue) Prompt Repair and Recovery of Damaged Muscle Tissue Following Exercise Low in Lactose (Less Than 1 g Per Serving) NOTE: SYNTHA-6 contains no hormones, creatine, stimulants, or aspartame. 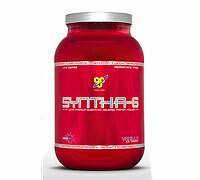 SYNTHA-6’s proprietary protein matrix consists of: 1. Ultra-filtered Whey Protein Concentrate Rich In Alpha-Lactalbumin 2. Micellar Alpha And Beta Caseins And Caseinates 3. Microfiltered Whey Protein Isolate Rich In Whey Isolate Peptide Fractions 4. Egg Albumen 5. Calcium Caseinate 6. Milk Protein Concentrate. Each of these proteins offers a unique and complementary profile of amino acids and amino acid absorption rates. Using SYNTHA-6 in between or alongside meals ensures that your muscles never run out of protein building blocks (amino acids). Sustained-Release Multi-Functional Micellar Protein Matrix: The matrix contains fast- and slowdigesting proteins. It thereby supports muscle protein anabolism (building) for up to 7 hours. Bioactive Protein Utilization Enzymes (Aminogen and Papain): This protein utilization system promotes optimum protein digestion and absorption, which improves the uptake of amino acids by the muscle. MCT's (Medium Chain Triglycerides), EFA's (Essential Fatty Acids), and Glutamine Peptides: EFA’s address essential fatty acid needs. MCT’s promote the oxidation (”burning”) of fat over carbohydrate and suppress appetite. Glutamine peptides support muscle growth and recovery. Rich in BCAA's and other Essential and Non-Essential Amino Acids: Contains more than adequate amounts of every amino acid you require. Directions: As a dietary supplement, take 2 scoops (equaling approximately 46 grams of protein) with 8-10 oz. of cold water or any beverage of your choice. Use approximately 4-5 oz of liquid per 1 scoop. Drink 2-4 servings daily, or as need to satisfy your protein requirements.